(Bloomberg) -- A proposed spinoff of Madewell could turn J. Crew Group Inc. into an example of what can go right for creditors of struggling retailers, instead of an epithet for everything that could go wrong. Lenders fought hard to retain their claim on fast-growing Madewell in 2017 when J. Crew, strapped for cash and trying to stay solvent, shuffled intellectual property beyond their reach. Now their resolve could pay off: J. Crew is mulling an initial public offering of Madewell, and it has to get permission first from those lenders. They could insist that proceeds be used to pay down their $1.4 billion term loan. “Most lenders assumed the company would do something with Madewell, which is exactly the reason why they negotiated to protect it,” Justin Smith of Xtract Research said in an interview. “The business represents a significant portion of value” and has grown with time, he said. The outcome might be good for J. Crew, too, cutting the preppy retailer’s debt down to about $347 million of notes and making it easier to fund a turnaround. A representative for the company didn’t immediately respond to a message seeking comment. J. Crew irked its lenders in a 2017 debt transaction as it tried to deal simultaneously with declining sales at its namesake brand, a shift by shoppers to online outlets and a $2 billion debt burden left over from a 2011 leveraged buyout. Like other troubled retailers, it chose a restructuring that sought to protect brands and intellectual property from potential bankruptcy claims. The change did little to reverse the company’s fortunes, but it rattled creditors and turned J. Crew’s name into a synonym on Wall Street for calamitous debt deals. To quell the revolt, J. Crew later agreed to rewrite its debt documents to give lenders more protection in any future transaction that involved Madewell, which specializes in denim apparel. The company’s loan soared more than 7 cents on the dollar to trade around 80 after the IPO plans were announced. J. Crew might find new freedom with the Madewell IPO, especially if it pays off the term loan and is left to operate with a leaner balance sheet, Noel Hebert of Bloomberg Intelligence said in an interview. With less debt, J. Crew will have more cash to invest in its operations, he said. “They’ve obviously been trying for such a long time to turn it around, but I think they were just completely blindsided by fast-fashion and new shopping habits,” said Gabriella Santaniello, founder of retail consulting firm A Line Partners. The brand has been diluted by repeated promotions and its identity isn’t clear, she said. Everlane and Kiel James Patrick have done a better job of capturing that “authentic Americana” look that J. Crew used to be known for, Santaniello said. By contrast, Madewell has strengthened its identity and stepped out of the shadow of its struggling parent, which is trimming locations. Madewell, with about 130 locations currently, plans to expand its standalone stores, adding about six more by February in the U.S. Already popular among millennial women, Madewell recently introduced a men’s line. Libby Wadle, named CEO of Madewell last week, said she sees a long runway for customers wanting denim. Same-store sales spiked 22 percent in the fourth quarter, more than triple the 6 percent gain at J. Crew. 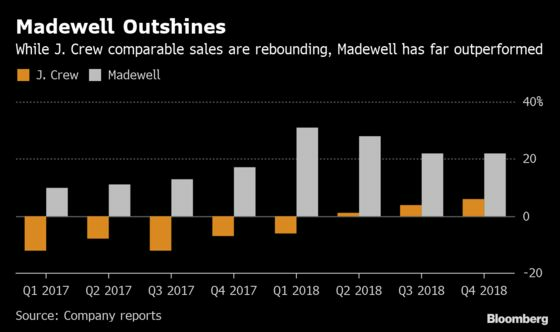 “While Madewell still generates less than a quarter of the company’s revenues, its record of comparable sales growth during the past several years while the J. Crew brand suffered declines points to likely meaningful contribution to the overall company’s enterprise value,” Raya Sokolyanska of Moody’s said in a statement. The future for J. Crew seems to be trending toward fewer stores, less foot traffic, and cost-cutting driven by a shift to digital products, Hebert of Bloomberg Intelligence said. This will save them money initially, but it’s not always the long-term fix that investors are looking for, he said.